The Bus Art Project MKE, founded by Libby Olbrantz, has finally made a couple stops Downtown. Published Nov. 30, 2018 at 11:18 a.m. Since it launched last spring the Milwaukee County Transit System's Bus Shelter Art Project has proved popular and there are now nine artworks installed on bus shelters in Bay View, Riverwest, Walker's Point and South Milwaukee. The program has just expanded to include two works on Downtown shelters, too. 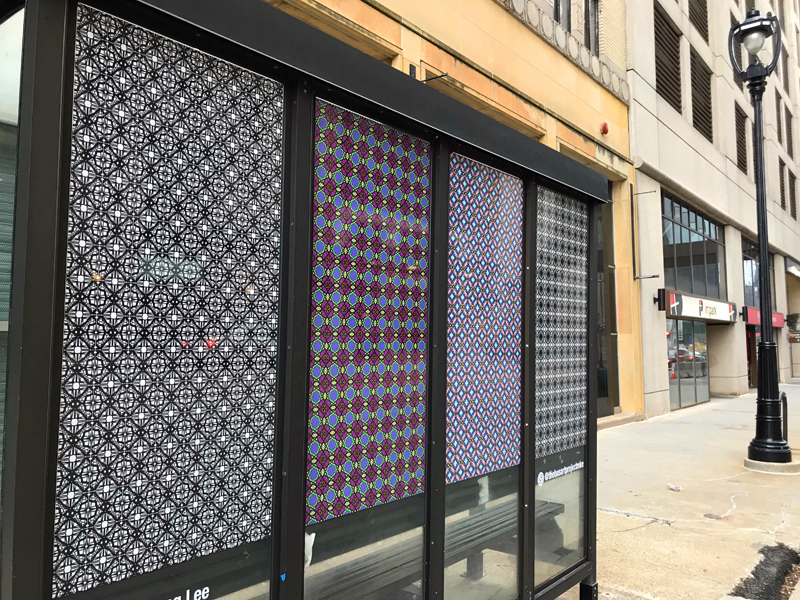 With a $1,000 grant from Milwaukee Downtown, BID #21 – an amount matched by Bus Art Project MKE, founded by Libby Olbrantz – exclusive works were added to shelters at Water Street and Wisconsin Avenue and a block north on Water and Mason Streets. 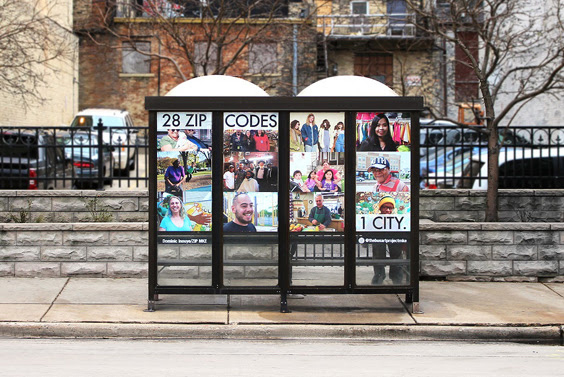 At Wisconsin Avenue, Dominic Inouye of ZIP MKE installed a photo collage that highlights the city's diversity, bearing the words: "27 ZIP Codes, 1 City." Meanwhile, near Mason Street, the shelter has a quartet of kaleidoscopic panels created by Tzeng Lee (whose name lacks an "e" on the installation), called "The Collide." These look pretty great from the street, but I admit a bit of disappointment that, at least in the case of "The Collide," bus riders making use of the shelter only get a monochromatic look at the work. "MCTS gives more than 15 million rides per year in the greater downtown area alone," said Milwaukee County Executive Chris Abele, who helped get the project started with an initial $5,000 personal donation. "As a longtime supporter of the arts, I couldn't be more excited that so many additional commuters, pedestrians and residents will now get to enjoy and be inspired by the work of local artists." More works are planned for installation next year. You can see all the current works at the project web site. 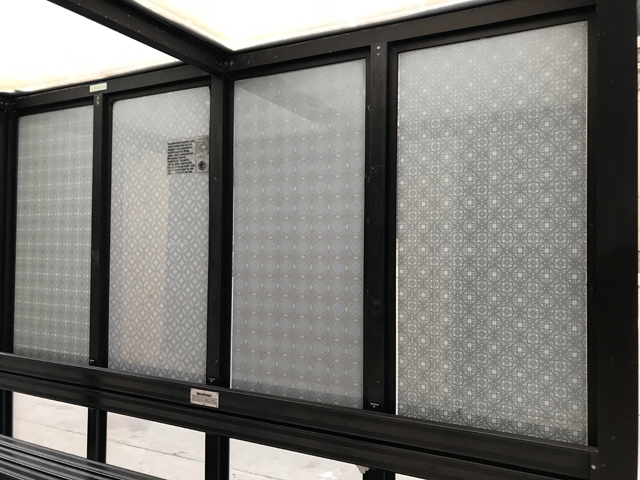 "This program is a great way to activate existing bus shelters as engaging 'third spaces,'" said Beth Weirick, CEO of Milwaukee Downtown, BID #21. "We're thrilled to help bring these temporary art galleries to life in the heart of Downtown."